DNA ROMs; nucleic acid memory; OxRAM wafers. 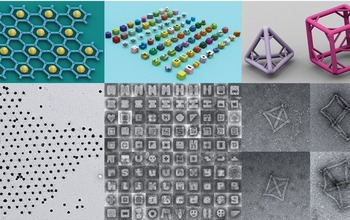 The National Science Foundation (NSF) and the Semiconductor Research Corp. (SRC) are investing $12 million to develop a new class of memories and other technologies, such as DNA-based read-only memory (ROM), nucleic acid memory (NAM) and neural networks based on yeast cells. The effort is called the Semiconductor Synthetic Biology for Information Processing and Storage Technologies (SemiSynBio) program. SemiSynBio is a partnership between NSF and the SRC. Existing memories are reliable and cheap, but they have some limitations. So, the industry is developing a wave of next-generation memory types, such as MRAM, phase-change and ReRAM, that are nonvolatile with unlimited endurance. In R&D, researchers are also developing an assortment of bio memories. Biological structures integrated with semiconductor technology could store 1,000 times more data than current capabilities, and retain it for more than a century, while consuming less energy. For example, the industry is working on archival storage technologies using deoxyribonucleic acid (DNA). DNA represents a promising memory platform for next-generation electronic devices. DNA doesn’t degrade over time and is very compact. So, it could be used to store a massive amount of data in a tiny space over a long period of time. A growing number of companies are working on DNA storage. Last year, for example, Twist Bioscience, Microsoft and the University of Washington stored audio recordings of two music performances from the Montreux Jazz Festival using DNA storage. In computers, discrete units are stored as “0s” and “1s” as binary code. In contrast, DNA molecules encode information with sequences of discrete units. In DNA molecules, the units involve four distinct nucleotide bases: adenine (A), cytosine (C), guanine (G) and thymine (T). To encode the music performances into archival storage copies in DNA, Twist Bioscience, Microsoft and the University of Washington devised a four-step flow using DNA–coding, synthesis/storage, retrieval and decoding. Still, there are a number of technical and fundamental challenges to make DNA storage a reality. *The development of DNA-nanowires. These nanowires will be grown using bottom-up self-assembly techniques with molecular and ionic dopants, and templated growth of inorganic structures. *The development of design rules for DNA-based multi-level memory cells. *Finally, the development of a DNA-based cross-wire ROM. Besides DNA ROMs, SemiSynBio is funding other projects, such as on-chip nanoscale storage systems using chimeric DNA, DNA data storage with nanopore-based reading, nucleic acid memory, redox-enabled bio-electronics and YeastOns. YeastOns are neural networks implemented in communicating yeast cells. In the program, Boise State University is developing nucleic acid memory (NAM). For this, there are two storage medium prototypes–digital NAM (dNAM) and sequence NAM (seqNAM). Leti, a research institute at CEA Tech, and CMP, a service organization that provides prototyping and low-volume production of ICs and MEMS, have rolled out the industry’s first multi-project-wafer (MPW) process for fabricating OxRAM devices on a 200mm foundry platform. 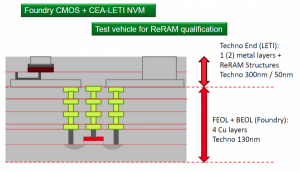 OxRAM is an emerging nonvolatile memory, which is a type of resistive RAM (ReRAM). Generally, there are two main types of ReRAMs—oxygen-vacancy ReRAM and CBRAM. Oxygen-vacancy ReRAMs are known as oxide-based ReRAM or OxRAM. OxRAM can be used for embedded memory applications on advanced nodes like micro-controllers or secure products, as well as for AI accelerators and neuromorphic computing. The MPW service is available on Leti’s 200mm CMOS line. The service provides a way to develop OxRAM. It includes Leti’s Memory Advanced Demonstrator (MAD) mask set with OxRAM technology. The new technology platform will be based on titanium-doped hafnium oxide active layers.This technology comes with a design kit, including layout, verification and simulation capabilities. Libraries are provided with a comprehensive list of active and passive electro-optical components. The design kit environment is compatible with all offers through CMP. Imec has been awarded a grant of 1.5 million euros to enable an ultra-compact microscopy technology based on on-chip photonics and CMOS image sensors. Imec will develop a technology called integrated high-resolution on-chip structured illumination microscopy (IROCSIM). The technology can be used in DNA, biology and medicine.